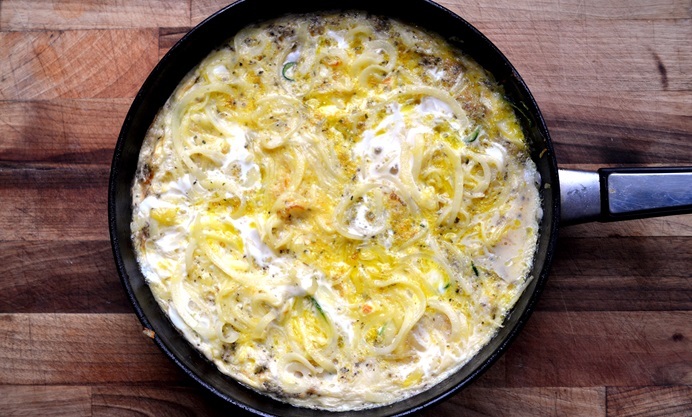 Food Urchin puts a culinary symbol of low-carb obsessives to excellent use in his spiralizer frittata recipe, or 'Spirafrizzata'. 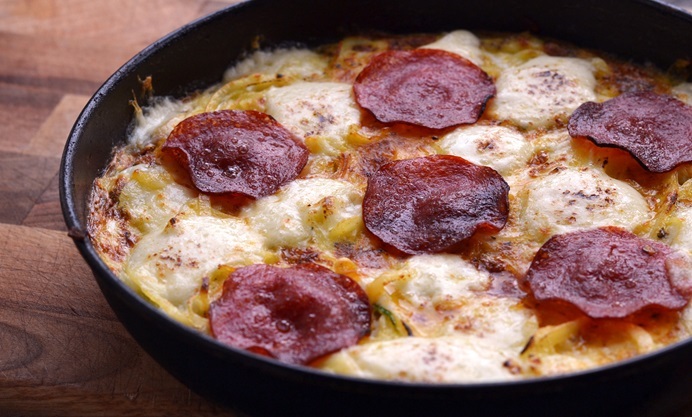 Packed with spiralized spuds, courgette and onion, with generous hunks of mozzarella and salami, this dish is for those who are more concerned with big flavours than counting calories. We’re not even halfway through January yet and if you are anything like me, you may already be experiencing a certain malaise, or discomfort, with regards to the boom of healthy eating and exercising that traditionally explodes during this barren month. Inboxes get filled with diet plans, celebrities in spandex suddenly appear everywhere and all those gym bunnies begin to whinge on social media, about the new influx of resolutioners clogging up the Stairmaster. It’s fairly awful really. I mean it only feels like yesterday, when I last legitimately hunkered down on a turkey, Twiglet and whole Camembert sandwich. I mean seriously, do we have to go through all this? Gadgets that are supposed improve, slim down and tone our portly bodies are probably my biggest pet hate. Objects of pain and misery, such as the ‘Abdominator’, the ‘Buttotromaphon’ and the ‘Spiralizer’. Oh yes, I spent the best part of 2016 positively sneering at that last piece of kit and the suggestion that ribboned beetroot is a fine substitute for pasta. The accompanying vapid, beatified smiles, airbrushed skin and general nutritional mumbo jumbo also got to me too. However, that is an easy thing to do. Especially when you look in the mirror and see Phil Mitchell staring back you; in his pants and dressing gown, holding a doner kebab, with extra chilli sauce. Yes, I must do something about my breakfasting this year, at the very least. 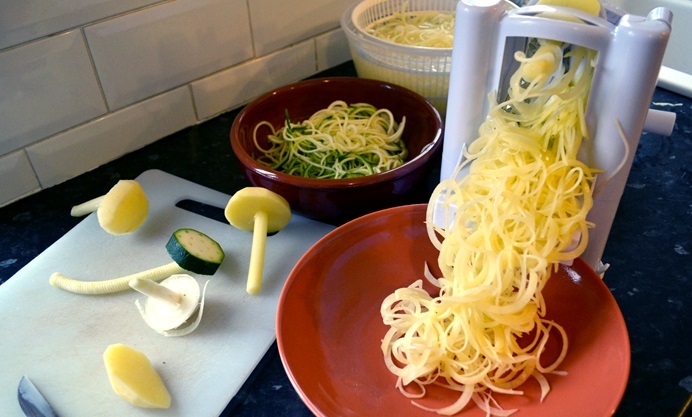 Then, during the Christmas break, I bought a spiralizer on a whim. And reader, it changed my life. Well, it changed an afternoon really, as I sort of plummeted into a frenzy, spiralizing whatever I could get my hands on. Carrots, potatoes, cucumbers, aubergines, salami, the lot. My wife walked into the kitchen after getting home from work and saw mounds and mounds of twizzles and noodles everywhere. She was carrying a Christmas pudding, a gift from her boss, and I spiralized that too. 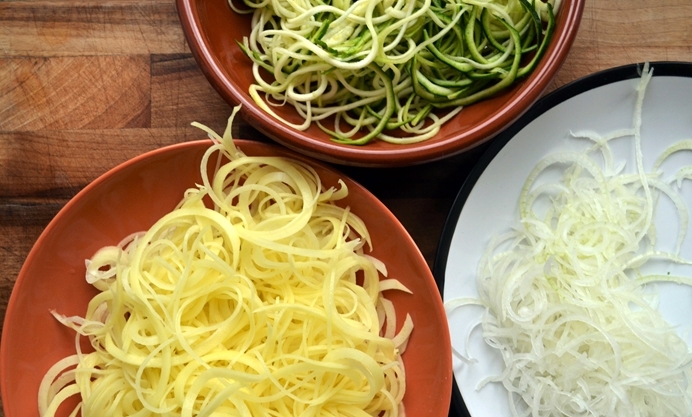 It didn’t work very well but I was thoroughly turned on by the limitless opportunities a spiralizer could bring. As an aside, I do get the whole deal behind them. 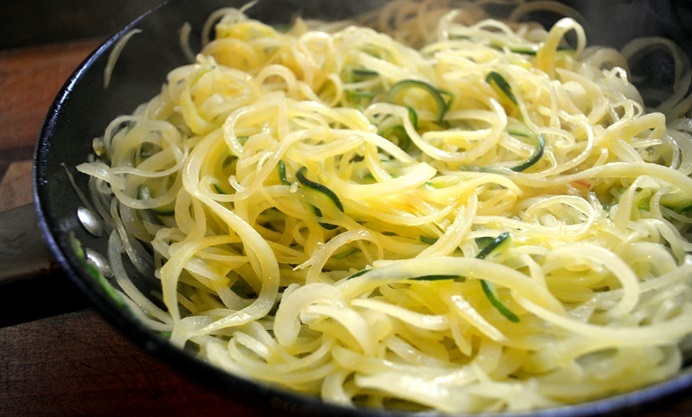 Spiralizers volumise, giving the impression on plates that you are eating a big portion, when really it’s quite small. A useful aid when you are trying to lose weight, although small is not the word I’d use to describe the bowl of julienned potato I had leftover. You could reach the ceiling with just four spuds and after realising that I was making a wasteful mess of everything, I finally got down to doing some cooking, frying the potato off with some curly wurly onion and garlic. 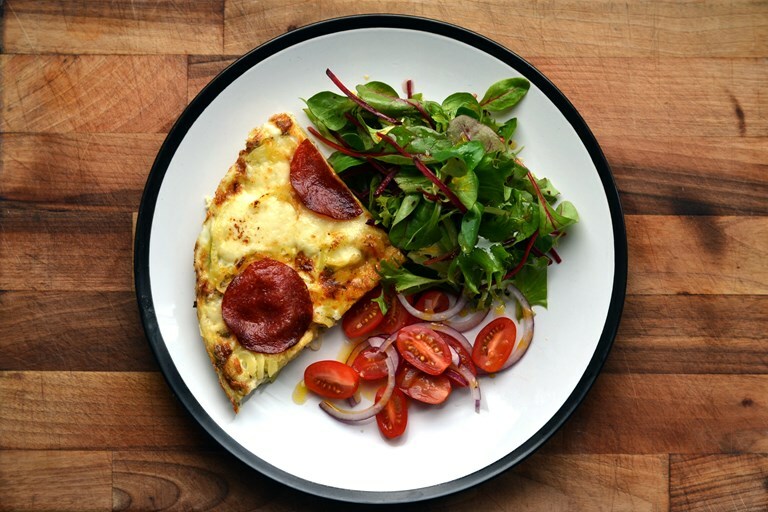 I then thought about adding some eggs, to bind everything together, with a dash of herbs and suddenly, we were heading into ‘frittata’ territory; that Italian go-to for fixing up something quick. Up until that point, it was all looking quite healthy actually. 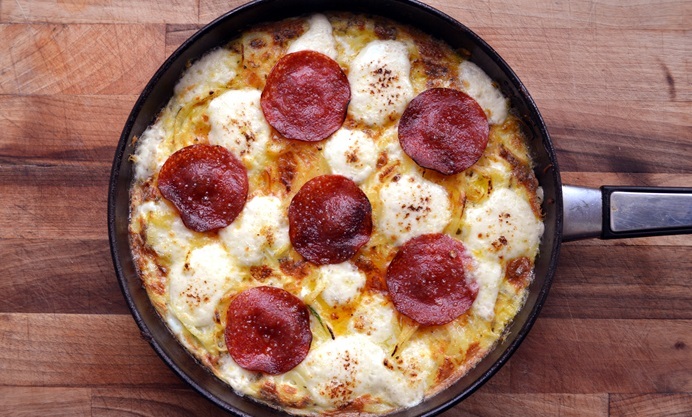 But then I went and spoilt it all by doing something stupid like adding pepperoni and mozzarella. And lo, the Spirafrizzata was born. An open omelette, with noodled vegetables inside and spicy meat and oozing cheese on top. It has become quite a hit in our house and if you are looking for an antidote to lift you out of the January blues, I am sure it will go down well in yours too. And if you are trying to be good but getting peeved by those gym bunnies, tutting impatiently behind you, as you struggle to dismount the ‘Glutifaxicator’, just remind them that they were more than happy to use your pub in December, before smiling and walking off with your tupperware box; full of spiralized radishes, spiralized bean sprouts and spiralized Toblerone.